This week I am delighted to have a slice a cake with fellow author Bill McCormick. Bill began writing professionally in 1986 when he worked for Chicago Rocker Magazine in conjunction with his radio show on Z-95 (ABC-FM). He went on to write for several other magazines and later transitioned to blogs. He wrote a sports blog at Jay The Joke which was featured in ESPN (The Magazine), Sports Illustrated, on the Jonathon Brandmeir Show (WLUP), and referenced many times in local newspapers including the Sun Times & Tribune. He still writes a twisted news blog at World News Center which provides source material for his weekly appearances on The Big Wake Up Call which airs on WBIG 1280 AM, FOX! Sports. Yes, you read that correctly, he does a show about anything other than sports on a sports radio station even though he has written extensively about sports. In 2011, Bill started submitting some fictional short stories to various publishers. Much to his surprise, and the consternation of linguists everywhere, they began publishing his efforts. Bill has expanded his repertoire to include comic books, graphic novels, and full-length novels. He has currently penned everything from dystopian nightmares to cuddly children's stories. Bill is a big fan of nicotine, vodka, music, and this rambunctious redhead (formerly a bottle blonde) who keeps waking up in his bed. What kinds of books do you write? I like to take complex topics and write about them in the simplest way possible. For example, the social implications of genetic mutation could take up an entire library. I whittled that down to about 300,000 words and people seem to still be able to understand it. In my short Janet Callahan, which was featured in Genesis Magazine, I wrote a single paragraph about the logical ramifications of religion. An entire planet killed themselves so they could go to heaven. I have had hours-long conversations with people at cons about that paragraph. Oddly, as dark as all that sounds, I use a lot of humour in my writing. I like taking the reader down winding roads with unforeseen scenery. Just because I know the eventual destination doesn’t mean I want them to. Can you describe your writing why? The critters in my head were taking up too much space so I had to let them out. Plus, I’m still a kid at heart. Some see a pencil, I see a rocket ship, or a submarine, or a space drill, or whatever strikes my fancy. If I didn’t let it out and write it down I’d probably be in the corner of a padded room drooling on myself. Worlds can change on the tiniest thing. History, written by the winners, tends to edit out the minutiae and record the broader stories. One item historians would edit out happened now. Which is a shame, because without this event the rest would never have happened. Nature called, and it was Sland’s turn to answer. It was almost even-fall, and they could hear the survivors setting up camp on the shore. They’d decided to wait until breaklight to see who was alive and in charge and then figure out their next move. Sland cared about none of this, although he was aware of it all. He just wanted to find a quiet tree and loose his bowels. He walked a considerable distance from their camp, found a suitable tree, and was just finishing with the last wiping leaf when he heard a harrumphing sound behind him. He slowly rose while pulling his pants up and turned. He was faced with a nice array of weapons, any one of which could kill him instantly. He finished buttoning up, and realized that this might be his last moment on Arreti. If so he wanted to go out with a laugh. He stood as tall as he could, expanded his chest and bellowed. Yep, that should be good for a laugh. He smiled as he gently stepped away from the steaming pile and waited to be executed. Instead, some of the weapons waggled for him to move forward and others waggled for him to put his hands above his head. He complied with both wagglings. They did not remove his weapons. His gun was still holstered on his thigh, and his sword was still sheathed on his back. His many knives were still hidden all over his body. Not that he saw any way of using them without being killed, but he noted it since it was odd that he still had them. They led him to the shore and into the middle of their makeshift camp. He could see they were all wet and tired. They didn’t look good at all. Of course, being blown out of a perfectly good ship and then swimming a kay or so to shore will do that to a brand. He assumed the reptiloid wearing more feathers and glitter than the rest was Quelnerom. He was dry and reasonably unruffled, so Sland figured he must have ridden in one of the longboats he saw dragged up on shore. He’d only heard him depicted, but this brand seemed to fit the description. One of his captors reeled off his bona fides as he’d given them and then they all stepped back a respectful distance. Sland chuckled to himself. He sincerely doubted that Quelnerom would follow through with anything other than having him killed where he stood. Well, it was fun while it lasted. Quelnerom stood and stared at him. Sland was astounded. Geldish was going to kill him if he survived this. 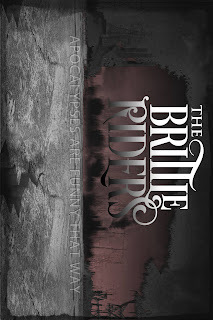 Well, The Brittle Riders trilogy has been repackaged into a single book, a/k/a Omnibus Edition, for release in the U.K., and, hopefully, the U.S. It’s the happy story of the death of every man, woman, and child on the planet and what happens next. I actually kill all the humans in the preamble so they don’t clutter up my story. Since I had a clean slate to work with I wondered what elements of human society would live on in the creatures who remained. I figured some religions, or pieces thereof, would remain; some methods of trade and commerce; and some forms of governance. Then I had to figure out if those disparate entities could ever work together. Of course, if the answer was yes I wouldn’t have much of a story. So I ended up with a six-foot-tall Christian cockroach, an Islamic mutant cow, a pagan reptiloid, and, of course, a Gnostic Cyclops, all of whom were brought together by an atheistic skeleton. It makes sense when you read it. 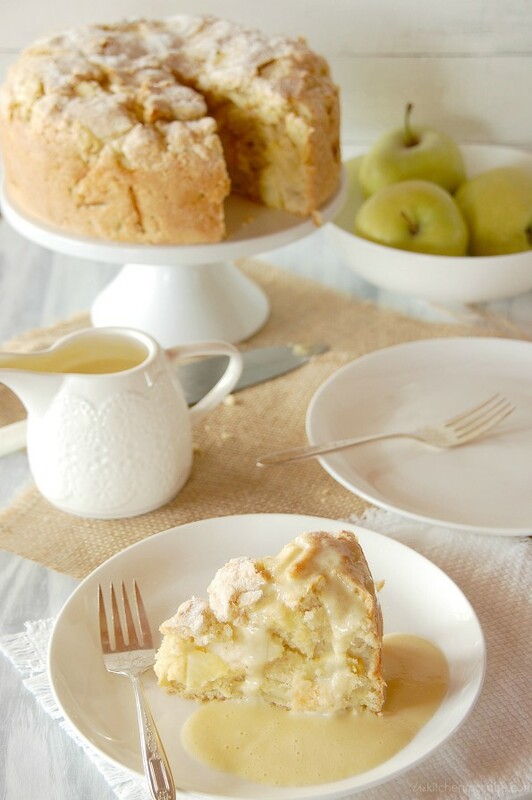 Although I’m more of a pie person I love a good Irish Apple Cake with Custard sauce. Sounds delicious. For those baking along, here is a yummy recipe for you to try. 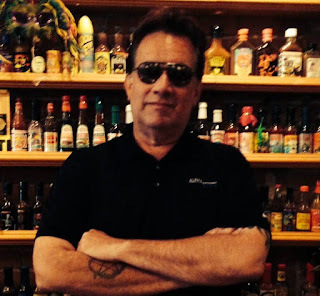 You can connect with Bill on his website, follow him on Facebook and Twitter. Join me next week when I will be having a slice of cake with Eileen Troemel. 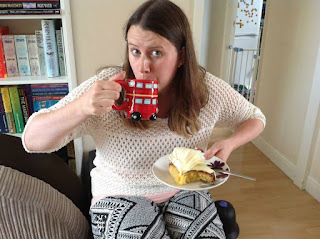 If you would like to take part in A Slice of Cake With... please fill in the form found here. I'd be delighted to have you. You can also support my writing endeavours and buy me tea & cake - it's what makes the world go round! 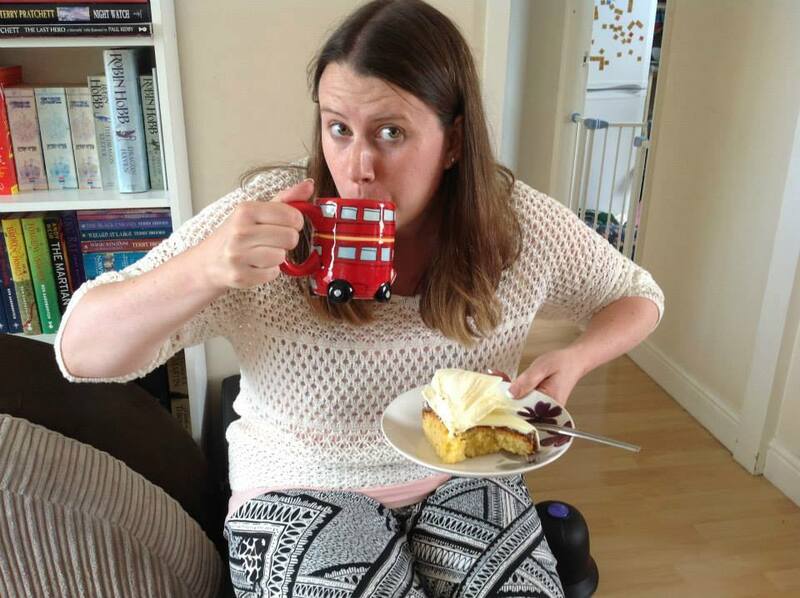 Claire Buss is a multi-genre author and poet, completely addicted to cake. Find all her books on Amazon. Join the discussion in her Facebook group Buss's Book Stop. Never miss a post, subscribe by email.